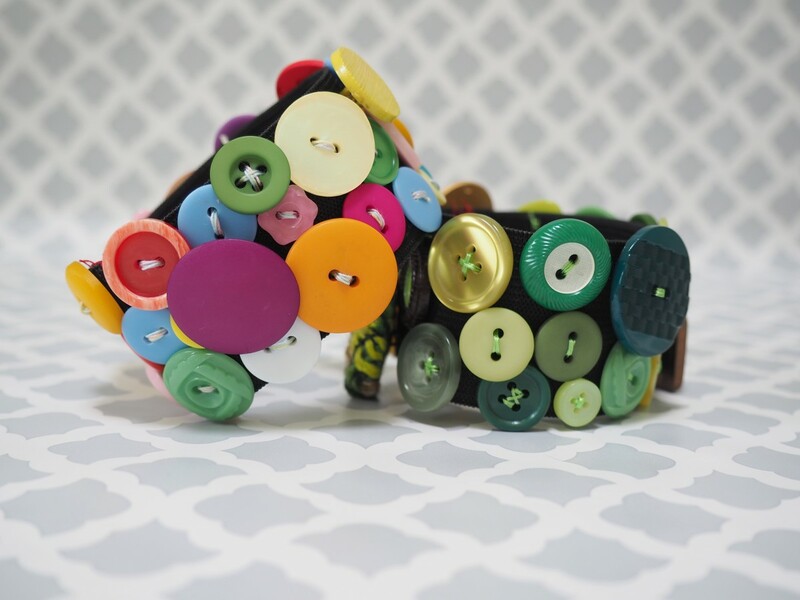 I'm a button hound. I love going to garage sales or flea markets and looking for jars of old buttons. I think it all began when I used to sort though an old cookie tin filled to the brim with buttons that my mother had gathered. To me they were like tiny jewels in all sorts of shapes and sizes. The only problem with having so many buttons is that my sewing space has started getting overrun with jars of them. 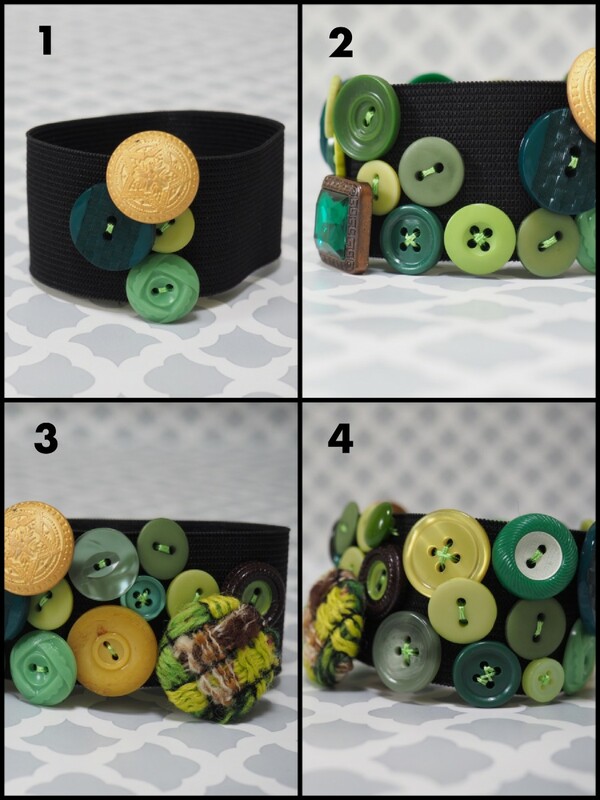 So to try and get a handle on the overflow, I've decided to make more button projects and this fun and flirty elastic bracelet is the perfect way to start. 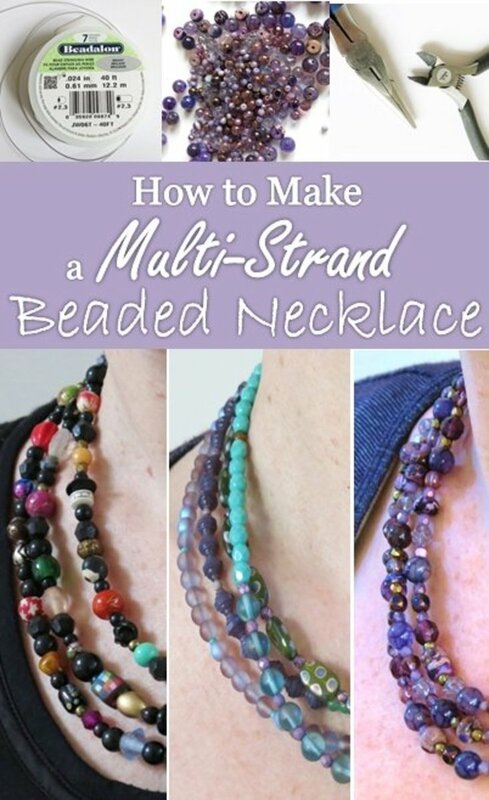 I began with the multicolored one because I thought that it would go nicely with all of the jeans and gauze blouses that I wear throughout the summer months. Then I decided to make one with various shades of green because I don't have any jewelry in those particular hues. You can see from the various photos that I have many different buttons in my collection. That's the fun of making this bracelet. Picking out the various shapes, patterns and colors is like a treasure hunt. I hope you have as much fun making this as I did. You won't need too much for this bracelet and all I needed to purchase was the elastic. Buttons - If you don't have any on hand, there are many nice variety packs available. Thread - Strong so it doesn't tear. I used a shiny strong rayon thread. Elastic - 2" wide knit. I used black like this one, but white is also readily available, and would give a completely different look to the bracelet. 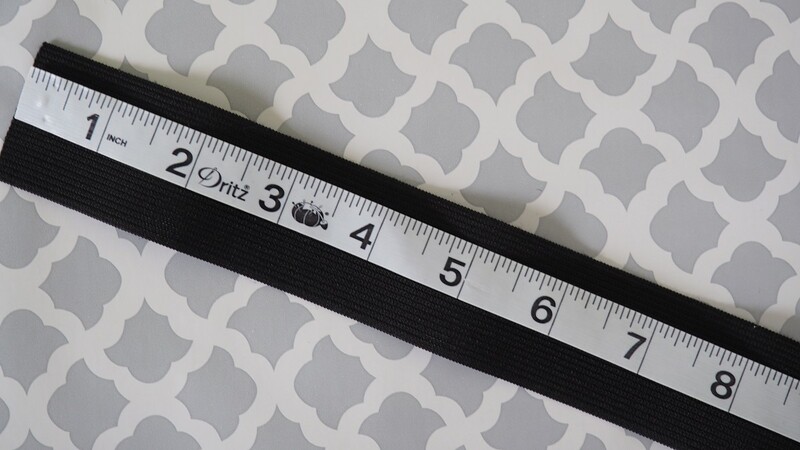 Take your tape measure and fit it around your wrist, deciding what length is comfortable for you. I have a large wrist and I like it a little looser for comfort, so I went with an 8" finished bracelet. 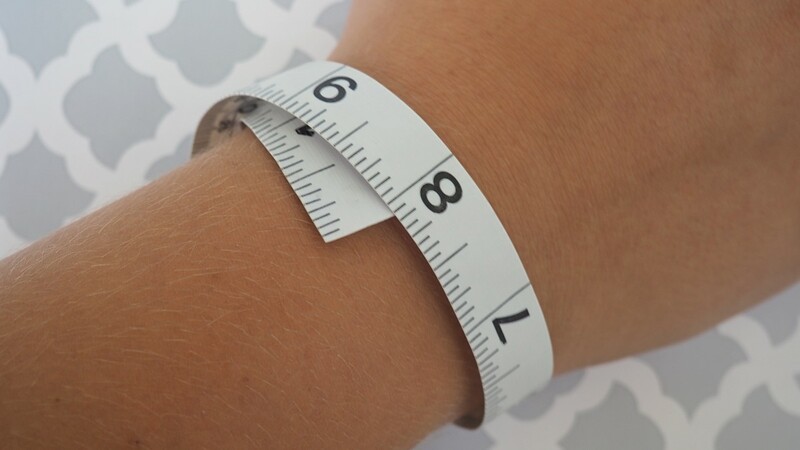 Before you cut that elastic, don't forget to add 1" to your desired bracelet length for the seam allowance. The most important instruction here is this one, add 1" to your desired finished length and then cut one piece of elastic to that size. Finished piece: 8", so cut the piece of elastic: 9"
You need that inch for the seam allowance. 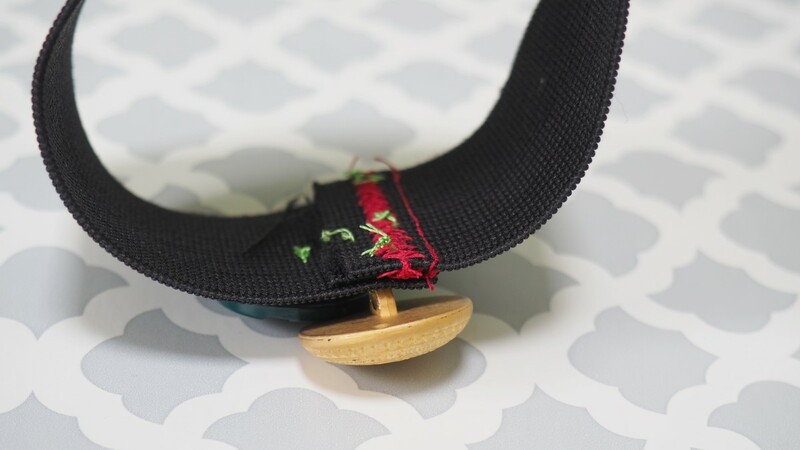 Join the two ends of the elastic together and sew a straight stitch across, 1/2" in from the edge. Backstitch at both ends. 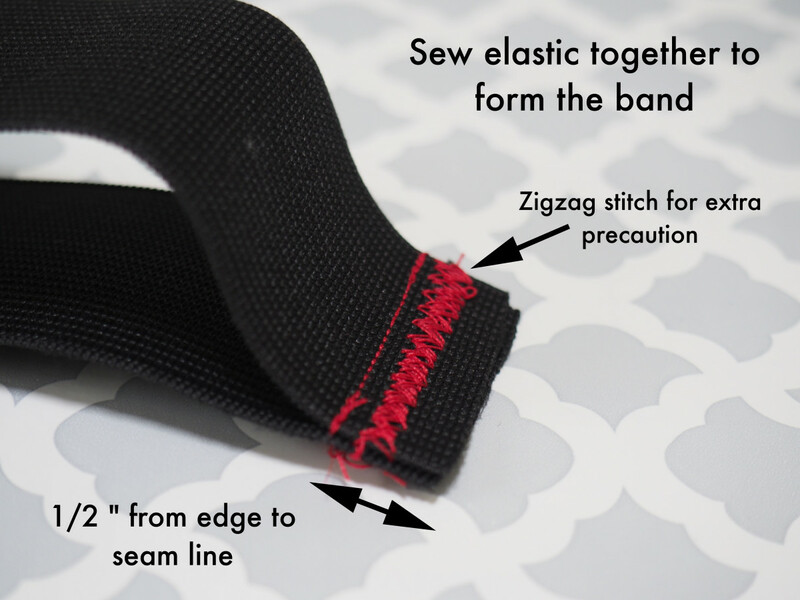 Then, for added security, use the zigzag stitch back and forth a few times. Flip over so the seam is on the inside to begin sewing the buttons on. Note: I used red thread so it was easy to see in the tutorial photos, but I would suggest using a thread color that matches the elastic color. I like to start sewing on the buttons along the seam just to make sure it gets covered and that the inside bulk gets tacked down. 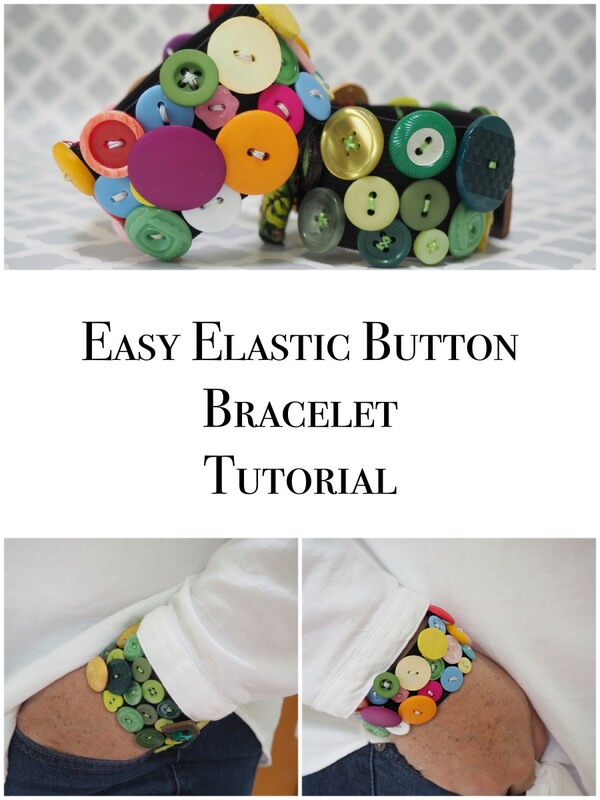 Choose the buttons you like and start sewing them on. 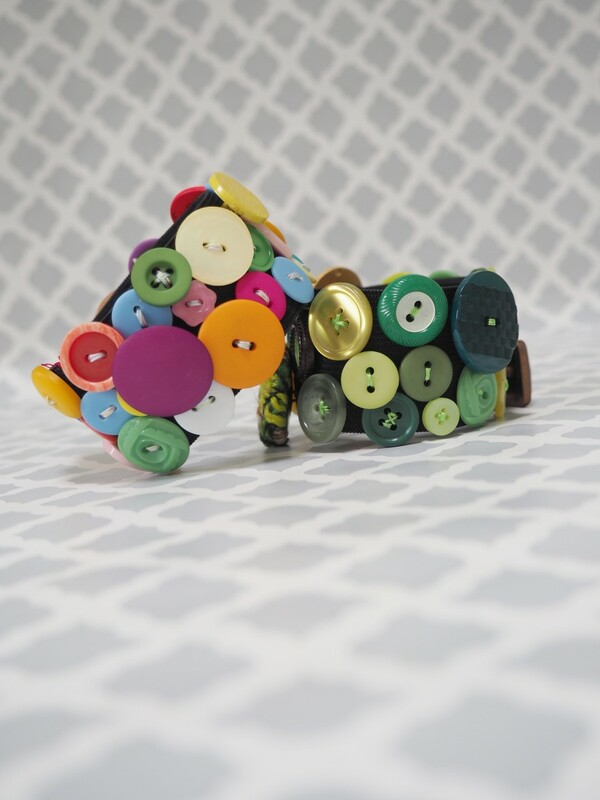 I sew and knot off each button individually. 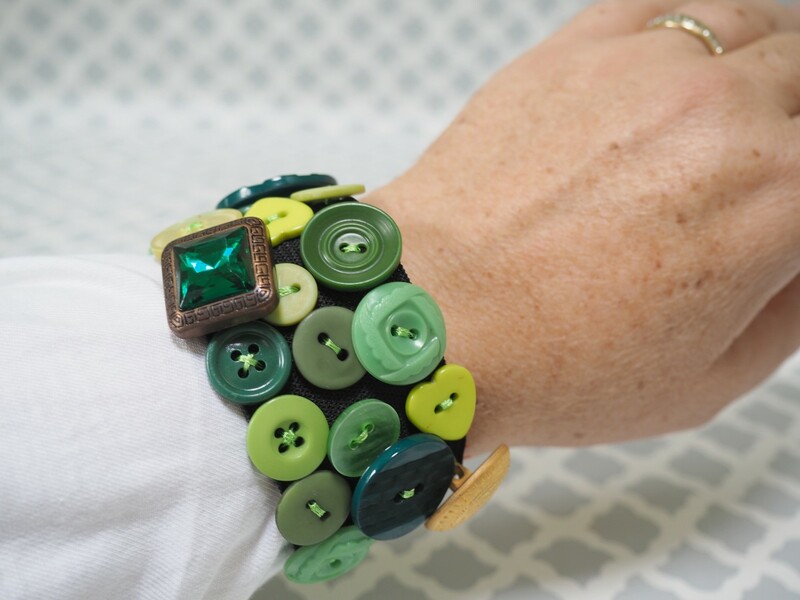 For this bracelet I used a bright green thread for all of the buttons. I think it added some more interest to the project. Feel free to use whatever thread color you want, even changing it from button to button if you prefer a more monochromatic look. 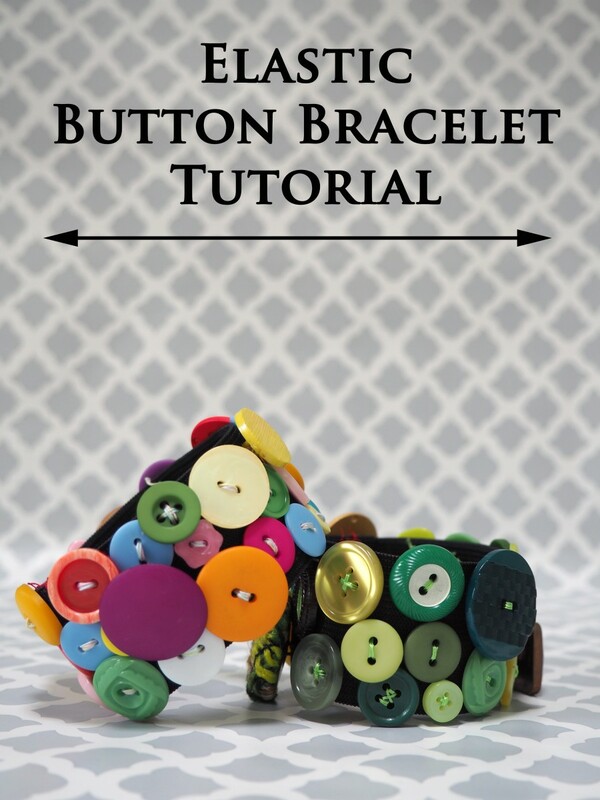 Keep adding buttons around the entire bracelet. 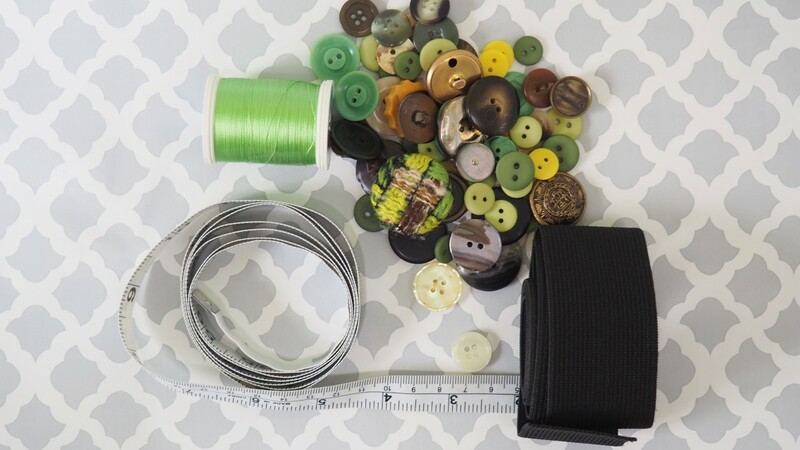 Keep some small buttons on hand so you can fill in some of the larger gaps. Mixing up shapes, sizes, and colors adds interest to the piece. You've finished your bracelet! I love this piece, even more than I thought I would. 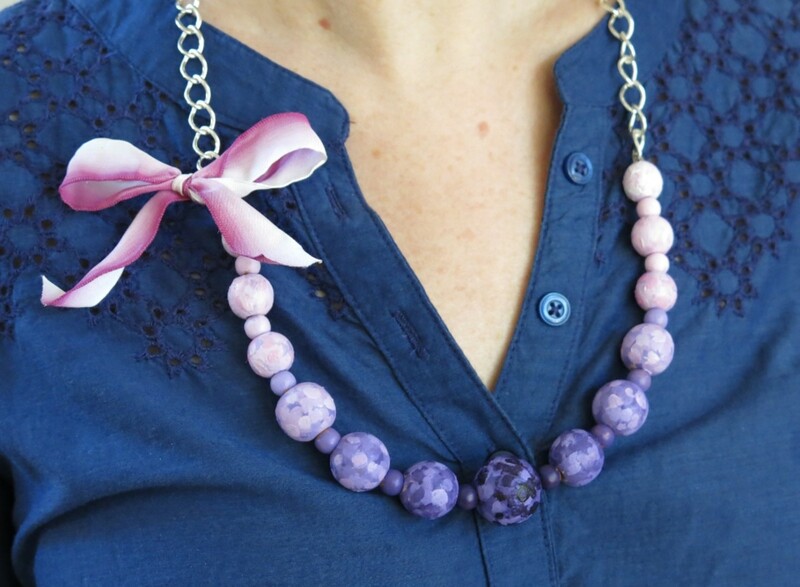 It's funky, a little flirty, quite fashionable, and can be made in any color under the sun. I also love that I was able to finish it in an afternoon. My multicolored one looks great with so many outfits and the green one, while more toned down, dresses up some of my more subdued solid blouses. I hope you give it a try. 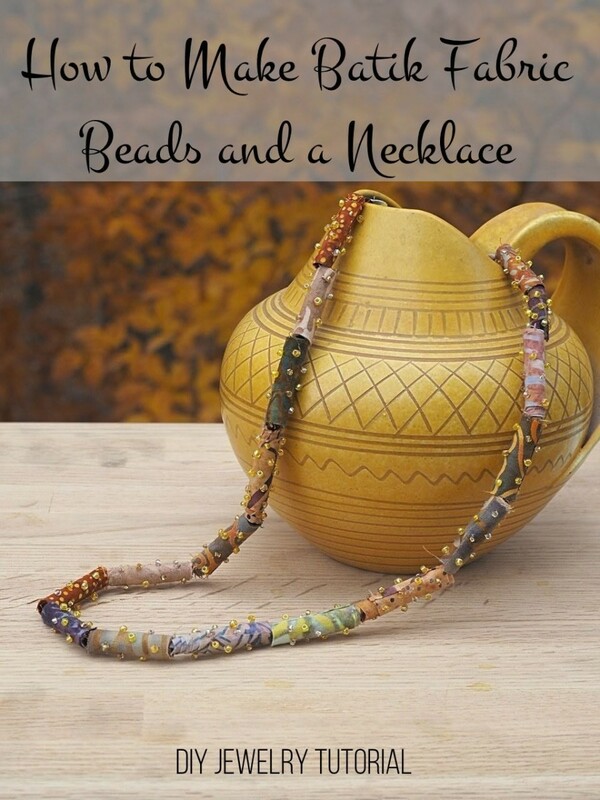 You won't be disappointed, and you'll end up with a unique piece of jewelry that you'll be proud to show off. You'll also get loads of compliments! What color are you planning to use? 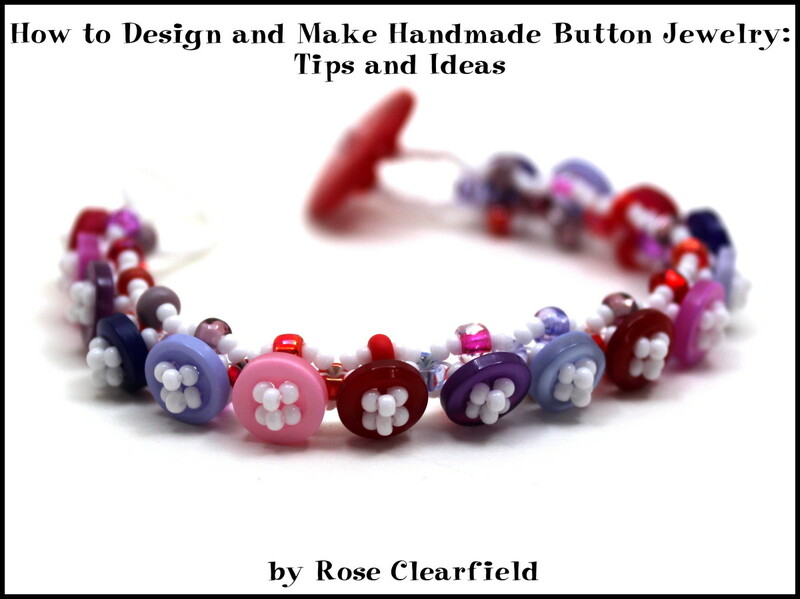 Unless you are using tiny seed beads to add a little bling, avoid using buttons or embellishments made out of glass, as they may break. Bracelets tend to get bumped around and you wouldn't want to ruin yours. I hope your button bracelet turns out well. 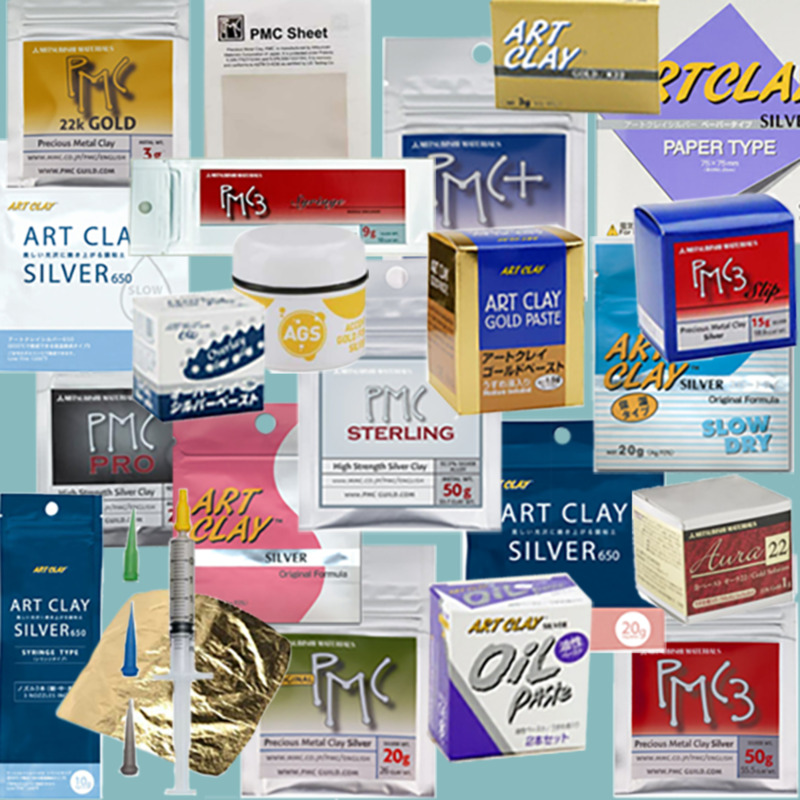 What color(s) are you planning on using? Thanks for reading. How nice to have the memories associated with buttons Peggy. I love simple household items that remind of family and friends. I'm going to check out your article. Thanks Margaret - I'm still loving these bracelets and have been inspired to make more. What a cute idea! I also like buttons and had loads of them from my grandmother's days of sewing. With some of them I covered a soft sculpture Christmas tree thinking of them like ornaments. Each year when I put it on display it brings back happy memories of my grandmother. I have written about it and my grandmother's sewing on this site. This is such a cute idea. I have lots of buttons in a bag I've collected over the years, so I will have to try this. Thanks for sharing this project, Claudia. 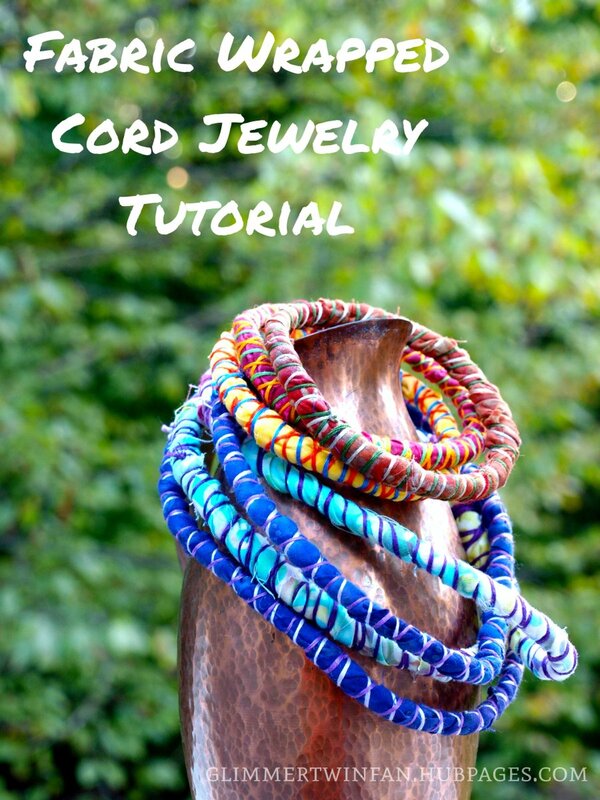 Claudia, this is a really fun project and an excellent tutorial! Hi Donna - I'm glad you like it. I'm getting lots of buttons now from a reuse/recycle shop in Pittsburgh PA and finding some really interesting ones. Now I just have to think of more crafting ideas for them. Thanks for stopping by and hope you are enjoying your summer. Thanks Heidi. I wore the green one today with some olive colored capris that I have. I'm going to have to make more of these. 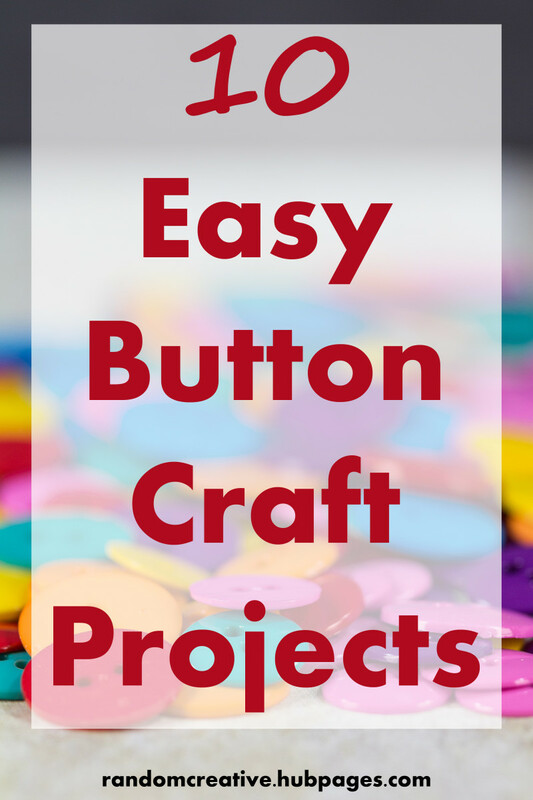 Great project, and I love seeing all your different buttons! 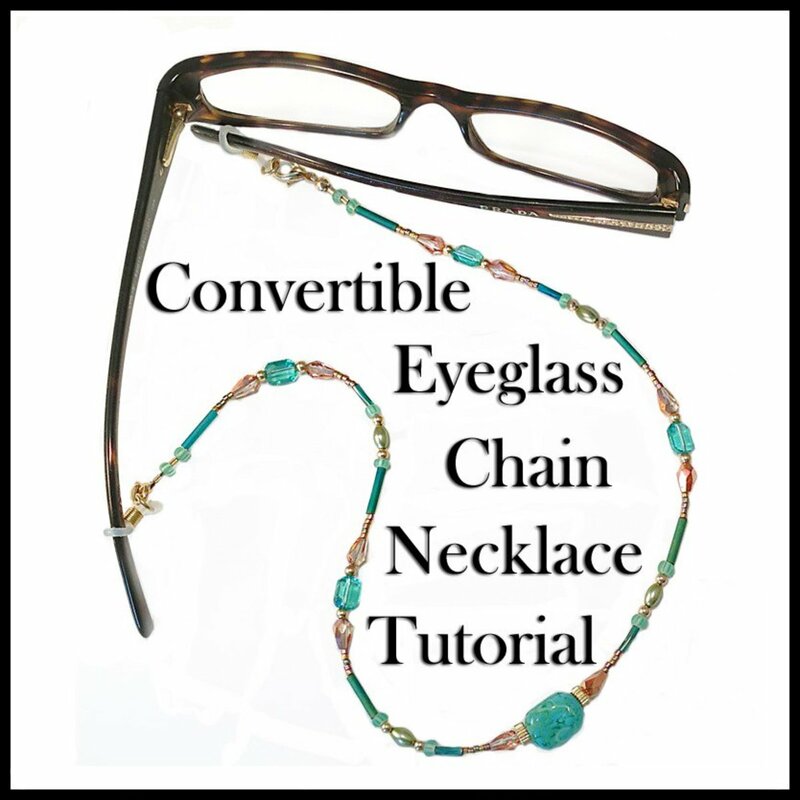 Thanks for sharing this fun jewelry project with us! That is so cute! Thanks for sharing this easy tutorial. Happy Weekend!